Mel Gibson’s movie, The Passion of the Christ, has stirred up a lot of controversy here in the States. Some say that it is the most controversial movie of the new century, even though it has also been one of the biggest box office successes in movie history. So far, it has earned over $300 million, and we are still a few weeks from the Easter season it so graphically presents on the screen. This is especially amazing since no Hollywood studios were willing to undertake the project, leaving Mel Gibson to provide funding and produce it himself. A lot of the debate comes from those who wonder if it is wise to so accurately portray the events written of in the Bible–an accuracy that even extended to recording the scenes in the language of the first century AD. Some believe the movie is anti-Jewish, since it shows how the Jewish leaders put Jesus to trial and then called so strongly for his execution. Others voice concerns over the graphic depiction of the crucifixion, saying that there is something wrong with anyone who would choose to watch humans giving an indescribable beating and whipping to a man before driving nails through his hands and feet. Perhaps it is the “indescribable” nature of Jesus’ punishment that made Gibson feel that a visual presentation was necessary. I have given a fair amount of time to studying the Bible and the historical context in which the book was written. The Roman punishment of crucifixion was one of the worst examples of man’s inhumanity to man. Those who wrote the scriptures had all seen crucifixions in person, and thus felt no need to describe it’s horrors in detail. But historians and scholars say that Jesus likely went through everything shown in Gibson’s movie, and believe it or not, it may have been even worse! Words fail in describing such cruelty, but Hollywood magic makes the brutality believably real. If I have a complaint about the movie, it is about how it ended. 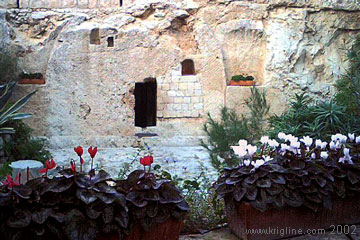 Jesus died on a Friday afternoon, and movie goers are not told that he remained sealed in the tomb until the third day afterward (this is the day we call Easter or Resurrection Day). While I am glad it showed Jesus alive again, I think a closing scene showing his reunion with his followers would have provided a taste of the joy that Christians experience when we consider the events of Easter. The resurrection was not just about coming back to life, but about proving that the sacrifice had worked—for the first time since Adam sinned, the way was clear for humans to walk with God as holy (i.e., forgiven) people. 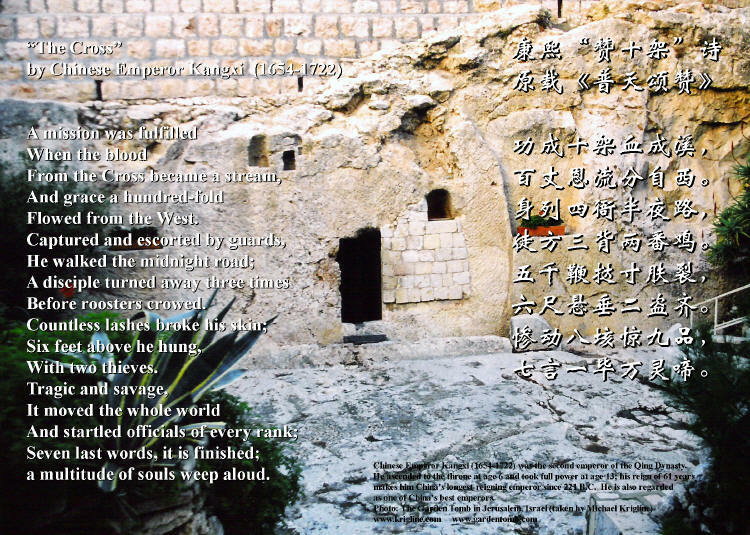 Just as the earthquake shown in the movie removed the barrier between God’s “most holy place” and “the people,” the resurrection removed the barrier of sin between God and humankind, for Jesus’ love had covered over the multitude of our sins. After watching in breathless horror for two hours, it would have been nice to leave the theater with “He is risen!” ringing in my ears. Two thousand years ago, the birth of Jesus split human history between BC and AD, and ever since then his Passion has split humans into two opposing groups: one which embraces the resurrection as the well-spring of faith, hope and eternal life, and one which fiercely rejects Jesus as a mad man who has deceived millions. From the moment of Judas’ betrayal until today, the Passion of Christ has captured the imagination and admiration of artists and poets, even as it has prompted the wrath of political and religious leaders all over the earth. Is it any wonder, then, that Gibson’s movie has stirred such controversy? And grace a hundred-fold flowed from the West. A disciple turned away three times before roosters crowed. Six feet above he hung, with two thieves. Seven last words, it is finished; a multitude of souls weep aloud. Notes: Chinese Emperor Kangxi (1654-1722) was the second emperor of the Qing Dynasty. He ascended to the throne at age 6 and took full power at age 13; his reign of 61 years makes him China's longest-reigning emperor since 221 B.C. I've also heard that he is regarded as one of China's best emperors. Chinese poetry is very difficult to translate, and this type in particular must abide by strict rules that limit the number of characters, thus it uses abbreviated terms and densely packed ideas. Notice how much longer the English is than the Chinese! Page 255 of Faith of Our Fathers by Chan Kei Thong does a great job of showing how ingenious this poem really is in its original language. 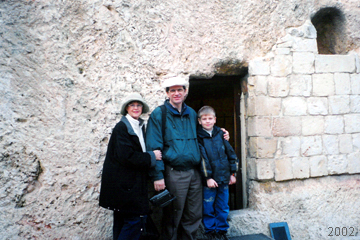 In 2002, we had the privilege of visiting Israel. Our time in this quiet garden near the city wall was one of the highlights of our trip. You can read more about this place at www.gardentomb.com or www.gardentomb.org. Click on the image below for a 5x7 version; feel free to copy/print it for personal use. The article and photos on this page ©2004 Michael Krigline, all rights reserved. Permission granted to print/copy for personal use.